We depart from our normal computer geek world for a foray into the world of construction geekdom. Over the past several years, we have been remodeling our home (see the blog posts about that). Now it had come time to pour the radiant floor in the basement. Of course, this being a remodel, it was not going be nice and straight forward. Our house was built in 1967, shortly after the Fairbanks Flood. The house was built on an existing foundation, however, after the flood-damaged house had been torn down. So, we do not have any idea how old the concrete and cinder blocks in our basement really are. This was slab-directly-on-grade. As far as we know, there was no blue foam between the concrete and the ground, and no excavation and back-fill. This made for very cold winters in the basement, and a lot of heat loss via transmission in to the ground. My original plan was to put down blue foam as a thermal break, and pour another layer of concrete over that. However, that would lose too much height in an already low ceiling. I kept searching for solutions. In my research, I came across Uponor Fast Trak, specifically the 1.3i variant which is a plastic grid into which you snap the PEX over a half inch layer of white foam which serves as a thermal break. You can then do a three quarter inch over pour with (in this case) Maxxon Gypcrete. The good: The floor is poured, and it looks great. The bad: Things didn’t work as Uponor said they would, and we had to do a lot more preparation work. We prepared the floor by putting 4-inch pressure-treated plywood strips around all the walls. This was so we could apply the Uponor edge stripping. This edge stripping is a thin layer of blue foam which adheres to the wall to protect it from the Gypcrete, along with a strip of polyethylene (PE) foil that is designed (in the case of the 1.3i) to lay over the Fast Trak to keep the Gypcrete from seeping under the edges of the Fast Trak. So, yes, we could have installed sheet rock first, but we chose not to. The first thing we noticed was that the adhesive strip on the PE foil would not stay adhered to the Fast Trak. Even trying to supplement it with duct tape, it found a way to pull up. This was with a factory edge against the wall. It seemed that the PE foil needed to be another inch or so wider. With a non factory edge, which might put the knobs a little farther away from the wall, it wouldn’t work at all. Thus, our first modification to the Uponor instructions: we removed all the PE foil from the blue foam, and caulked along all the edges. Our second modification was similar: instead of taping all the non-factory seams, we caulked those as well. The 1.3i has no adhesive to hold it down. The factory edges have an “overlap” mechanism where the knobs from one sheet clip over the knobs of another sheet, kind of like Legos. But there is no clipping or gluing for the rest of the seam, which makes one wonder how it prevents Gypcrete from seeping in. This leads to our third modification and a lot of additional work. In discussions with our Gypcrete contractor (and his discussions with his Maxxon representative), it was realized Gypcrete could easily seep under this and cause it to float, destroying the pour, and creating a huge mess to clean up. 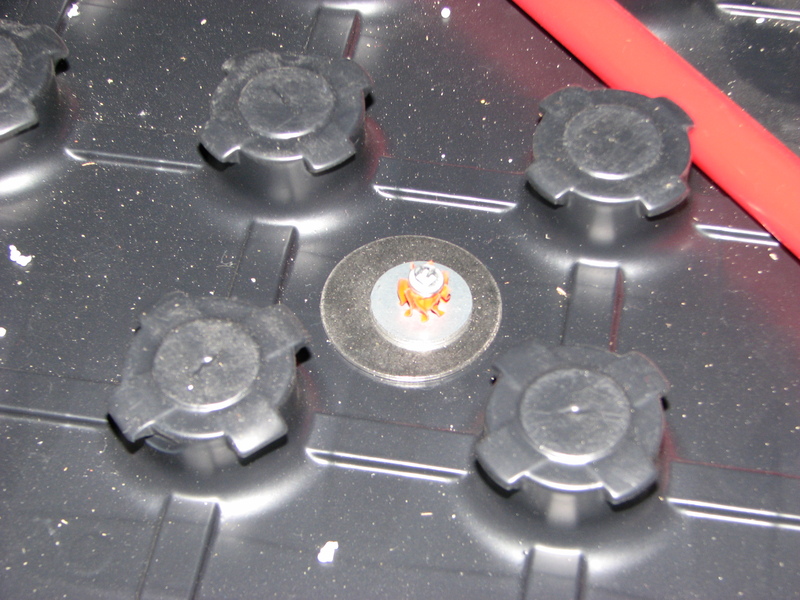 Initially, we put down 1.5 inch nails with washers (like these) at the corners of the sheets (and at spots in partial pieces), but that was increased to 12-inches-on-center on the recommendation of the Maxxon representative. With the nails only at the corners, there was still concern the Gypcrete seeping under could effect deflection of the foam, causing the floor to partially float. Now, remember that reference to concrete that was who-knows-how-old? This meant that some of it was somewhat OK, and other parts of it were rather “rotten.” This created very inconsistent performance with the powder-driven nails. So, it would be between “destroy concrete and don’t hold at all,” to “OK,” to “not driven far enough,” to “punch all the way through the foam and plastic.” It was those first and last cases that caused the most problems. For the first case, you just had to find another spot (and caulk the hole you just made). For the last case, you also had to find another location, but there was a solution. Even with those washers, there were still a few that punched all the way through. By the way, this was using the Ramset Brown loads which are two out of five on their power scale. 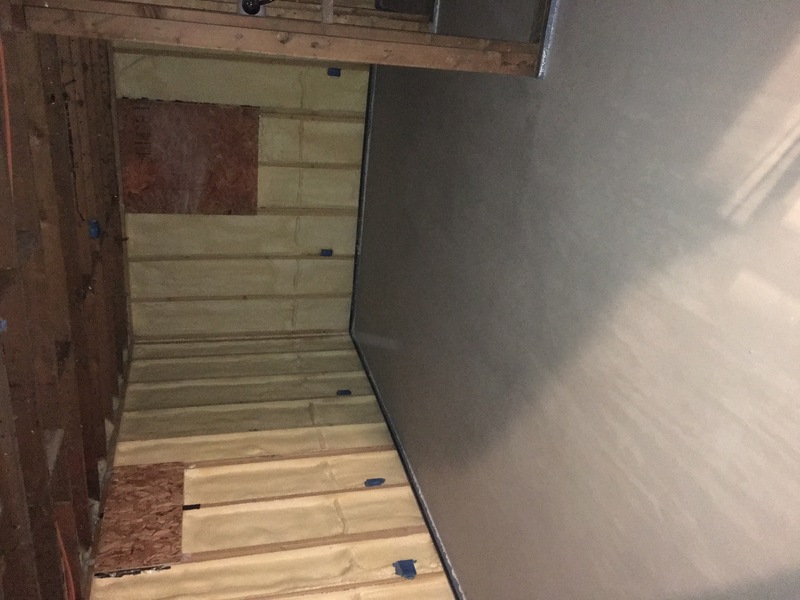 When it came time to actually put down the PEX, that’s when the Fast Trak really lived up to its promise: we had the entire 700 square feet done in probably no more than an hour. It was really easy to walk along with the PEX and snap it down in to the knobs. Fast Trak 1.3i is a really great product, but it seems to need some tweaks in the install process. 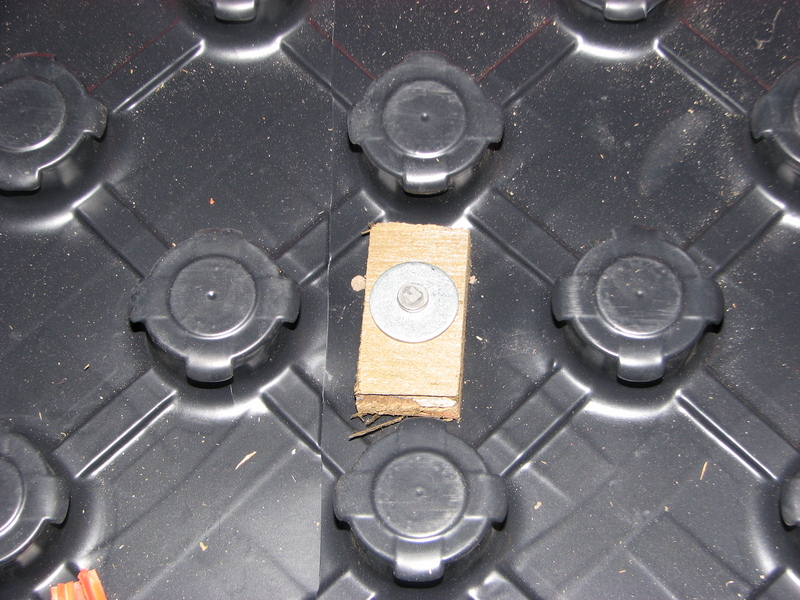 If I ever use this product again, I would like to try gluing the panels to the floor using a foam glue. I am not sure, however, how much buoyancy the plastic panels will have, but I don’t think they would separate from the foam panels. It would be interesting to see if one could successfully install the product without resorting to several hundred mechanical fasteners. When the pour was finally done, it went great. There was no floating, and no seeping in to the wall base plates under the edge stripping. It looks really good, and we look forward to actually running hot water through it!